For the fifth year in a row we, Embassy of India and art of living in you to celebrate the International Yoga Day organized in Stockholm after last year's success! open and free to all-limited places. Free yoga mat and t-shirt for the 1000 first registered! 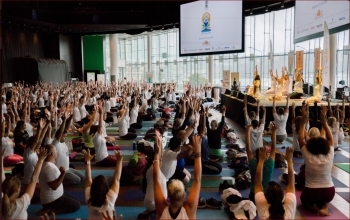 The Yoga event is led by a fantastic team of experienced teachers from Art of Living, the Indian Embassy and local yoga teachers, The evening's main guest and instructor in Stockholm is the internationally known yoga Swami Jyothirmayah. It is therefore an excellent opportunity to expand your horizons and learn something new. event is open to everyone regardless of experience or background. Beginners as well as experienced yogis are warmly welcomed for inspiration, knowledge and community. Bring your yoga mat, your friends and your biggest smile to this lovely "master class"! Embassy of India and Art of Living, invite you to Join us in celebrating the 5th International Day of Yoga after last years success! Open and free to everyone registration required, limited seats. Free yoga mats and T-shirts to the first 1000 to register! The event is open to all regardless of experience or background. Whether you are a beginner or experienced yogi, we invite you to this yoga session for inspiration, knowledge and a sense of oneness. The evening will bring together an amazing team of experienced teachers from Art of Living, Indian Embassy and local yoga teachers. The guest of honor and leading yoga teacher in Sthlm is the renowned yogi Swami Jyothirmayah. It is therefore a great opportunity to expand your horizon and learn something new.